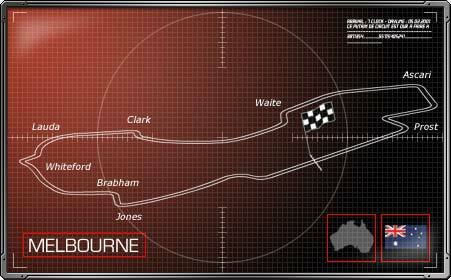 Melbourne ran its first Formula One race in 1996, after taking the Australian venue from Adelaide. With this maiden race, also came the shift of the Australian race to the beginning of the Formula One calendar. The transition didn't come smoothly, with many disruptions from protesters, which still carry on today, although the numbers have greatly dwindled. The Melbourne track, is contained in a park, the layout smooth and flowing, with no 90 degree street corners to break the speed. It runs clockwise around a lake, and the scenery is breathtaking. All the drivers love racing there. Damon Hill, still all charged up from his victory in the closing race of 1995, continued where he left off, winning the maiden victory, after his new Williams team-mate, Jacques Villeneuve, had to slow at the end of the race with engine problems. 1997, Melbourne’s' second year, Jacques Villeneuve looked set to win again for Williams, after dominating qualifying, by a massive margin, but he was taken out on the first corner by Eddie Irvine, and so David Coulthard raced on to McLarens first win since Adelaide in 1993. This race also gave Damon Hill an early indication that his run with the Arrows team, would not be smooth, as his car coasted to a halt on the parade lap, preventing him from participating in his first title defending race. 1998, who of us will ever forget the season opener? A race that was won with such total dominance, and under a huge cloud. Once again David Coulthard looked set to win, after teammate, Mika Hakkinen, lost so much time in the pits. Learning of the Fins predicament, David slowed to let Mika pass, honouring a gentleman’s agreement the two had made before the race. Fans all over the world went wild. 1999 saw Eddie Irvine take his first ever GP win for Ferrari and although the Irishman had left for the Jaguar team for the 2000 championship, it was another Ferrari victory, this time a one two with Michael Schumacher claiming his first ever Australian win and new teammate Rubens Barrichello coming in second.